New users need only fill out a simple form to request an account. They provide standard information such as their name, email address, and handle (their online name). The registration form is a Smart Form that provides callout help messages and tabs for help with the registration process and to (optionally) review your site's Terms of Service and Privacy Statement. Upon submitting their request, a confirmation email is sent out to verify their email address. This email message includes instructions for completing the registration process. Unrestricted Access sites allow any user to register once the email confirmation step is completed. Moderated Access means user requests for access must be approved after the email confirmation step. Closed Access means users cannot request access. 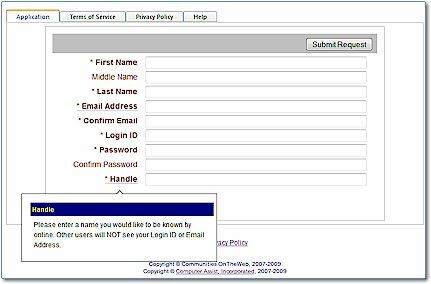 New users are manually added by a User Administrator so that you can control a restricted community. External User Sources can also be integrated into you site where you already have a trusted source of user data. Users don't register through our standard interfaces, but instead are managed through your existing systems.